New stock of BeeCosies has arrived! October 28, 2017 by Chris Wray. The BBKA's winter survival survey for winter 2014 showed losses across the UK of 14.5% with losses of 15.5% for the North East where most of our Bee Cosy sales have been made. As for winter 2012 and 2013, we surveyed all Bee Cosy users on the same basis as BBKA - i.e. colonies in place at 31 March. Although our sample is not large as the BBKA, we achieved a fantastic 98% survival rate from all the beekeepers who responded using a total of 40 Bee Cosies. As you recall, the winter of 2014 was not as bad as forecast. Bad weather was confined to fog and icy roads in December, storms and strong winds in January, and some snow in early February. The Met Office’s statistical summary showed that, across the UK, “the average winter temperature was 0.2 degrees higher than usual for 1981-2010. There were 25% more hours of sunshine than usual, and slightly less than the usual 33 days of air frost ” Despite 2014 being a mild winter, BBKA statistics showed that UK colony losses still increased to 14.5% from 9.6%. As seen in the graph below, with 3 years of survey results now in, the Bee Cosy does seem to be making a difference. Whilst there may be a small positive bias in these results in that the Bee Cosy may attract a more assiduous beekeeper, there is also an element of negative bias in that beekeepers may be choosing to put Bee Cosies on their weaker hives. Overall, I believe the results show a good case for the merits of the Bee Cosy. September 20, 2015 by Chris Wray. Make sure you have a viable colony with a good laying queen before the end of autumn. You can often spot a failing colony by the bees - not flying in good numbers on sunny days - seeing that they are anxious (walking quickly over their frames) - not bringing in pollen - or if you've seen hive weight drop despite good weather and forage . If weak or failing, combine or make the decision early in autumn to re-queen if possible. Check for stores - do more than just heft the hive - use spring balances to estimate hive weight - deduct 10% for the possible error in this method - deduct the weight of the hive plus drawn comb and say 2kg for the bees! - My colonies consume between 8 and 12 kgs of stores in the winter (end of October to end of March) depending on their size (with a Bee Cosy fitted) so I plan to have at least 12 kgs of stores - ideally 15 kgs - depending on the strength of the colony. Feed 2 kg :1 litre sugar syrup if stores are short - warm weather is best- between 12.5 and 15 degrees depending on the level of sunshine during the day - Don't overfeed! - They may still be able to bring in stores from Ivy if they need it and some empty cells for winter brood rearing and clustering is better than a brood full of stores. Varroa treatment - pick a week when the weather is fair - ideally with some sunshine to raise hive temperatures - the later the better as there will be fewer varroa in the reducing winter brood and more will be impacted by the treatment you choose. Do what you can to keep heat in the hive - varroa treatments work better the warmer the hive. Hive check and prep - take off queen excluders, replace glass crown boards with wooden ones, reduce draughts in and around the hive, check for gaps between floors / brood boxes / supers / roofs - fix mouse guards. I prefer to leave the plastic trays in my OMFs in and reduce air flow through the hive. Reduce unnecessary space to help your bees keep a good hive temperature - If you have roofs with big empty spaces fill them with paper / carpet / foam - and critically - if you have small colonies where there may be 3 or 4 frames not occupied take empty frames out and replace with blocks of insulating foam cut to size. Check you have your Bee Cosy fitted! - as well as reducing the stores needed in 2 above, it will also help with points 3, 4, 5 and 6. Good luck for Winter 2015 - let's hope it's kind to our bees! When a family of honeybees is to big for the house! This year has seen a lot of strong colonies building up and the inevitable swarm! When your down to your last piece off equipment you really hope that the bees will make it their home! This swarm was caught on the lower branches of an old oak tree that most of our swarms seem to choose as their temporary home. 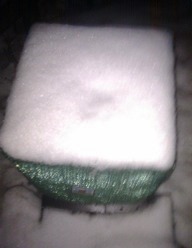 And yes - they did make the small one bed flat their home! October 22, 2014 by Chris Wray. We've all probably wondered what a honeybee really looks like when it's flying in slow-motion. Well now we know? The BBKA's winter survival survey for winter 2013 showed losses across the UK of 9.6% with figures for the North East where most of our BeeCosy sales have been made of 10.9%. As in 2012 we surveyed all Bee Cosy users on the same basis as the BBKA survey - i.e. colonies in place at 31 March. Although our sample is not large as the BBKA we achieved a fantastic 98% survival rate from all the 25 beekeepers who responded. July 31, 2014 by Chris Wray. 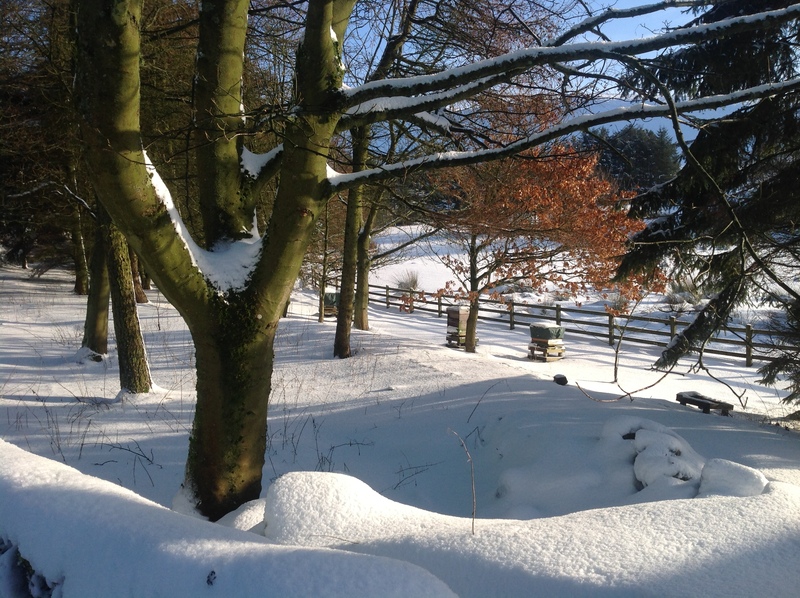 Bee boles made a big difference in winter two hundred years ago! They helped keep hives dry and protected from the cold, wind and rain. After a long trip down to Essex it was great to talk to such a different mix of beekeepers although I did arrive back in the early morning! The room included a wide mix of experience and for the first time a number of really experienced commercial beekeepers. The weather, forage and potential for honey harvest are really very different in Harlow than Yorkshire. 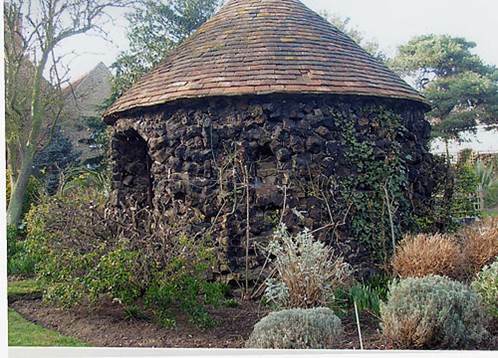 Interestingly though in preparing for my talk I did find some examples of bee boles used in Essex and probably the prettiest example of a circular bee house. Thanks to David Tyler for arranging the session and his purchase of 10 Bee Cosies! November 18, 2013 by Chris Wray. Heather honey harvest 2013 - Uncapping frames, scraping into the press and making loads of honey! October 25, 2013 by Chris Wray. It was a good turnout at the York and District Beekeepers Association's meeting recently at the Museum of Farming for my talk on the Wintering of Bees with about 30 in the room. It was great to share information, experience and ideas on the wintering of bees as we go into winter 2013 with such a warm and friendly group of knowledgeable beekeepers. There were lots of great questions and comments on hive insulation, feeding of winter stores, the impact of different types of hives and how everyone's apiary has a different challenge! October 18, 2013 by Chris Wray. Recently I had the pleasure of meeting with beekeepers from Malton and District when I gave a brief talk on the wintering of bees and all the information I had come across in my journey to develop the BeeCosy and find other ways to help manage bees. The picture above is interesting given the topic of my talk "The Wintering of Bees". It shows how bee boles used to be made out of the sides of stone buildings facing south to house straw skeps full of bees. The plan being to use the heat built up and held within the stone to provide help to colonies through low temperatures and bad weather. Definitely an early version of the Bee Cosy! Many thanks to David, Richard and everyone at Malton for giving me the chance to meet everyone in such a hospitable setting and for such a great set of questions. September 15, 2013 by Chris Wray. Time for the girls to kick the boys out! September 12, 2013 by Chris Wray. BeeCosies help protect colonies from hot weather too! This season I have left BeeCosies on all my colonies to encourage brood-rearing and thereby make increase through splits and swarms. The BeeCosies also help the bees work the abundant heather we have close by. As colonies keep their brood nest at around 30C when they are brood-rearing, my logic was there would be no harm in leaving BeeCosies on unless temperatures got above this level. In the Yorkshire Dales this is highly unlikely! In July even when temperatures soared to nearly 30C - the Cosies were left on to provide insulation from the hot conditions. To test the merits of this approach, on one particularly hot day, I took off a BeeCosy, returned an hour later and measured the temperature with a surface thermometer on the hot metal roof as 52C! By leaving the BeeCosies on I hoped to slow down the build-up of excessive heat in the hive at midday, increase average night time temperatures and so flatten out temperature extremes. The strategy has definitely helped me grow from 4 to 10 colonies this year and all 10 colonies have feasted on abundant heather we had in late August. The BeeCosies have raised hive temperatures which has helped the bees reduce the water content of nectar and so make heather honey for longer in the evenings. In the last 4 days of August, 10 colonies added a total of 9Kgs – the largest adding 2Kgs. So we are hoping for a good heather harvest from around 5 of the colonies, the other smaller ones being able to build up a good supply of heather honey supplies for the winter. BeeCosies help 4 colonies grow to 10! Going into Winter 2012, I had 4 four colonies, two on double broods, one on a brood and a half and one on a single brood. As we know, winter 2012 was particularly difficult for our colonies due to harsh cold conditions from December to March. Apart from weekly weighing for stores, however, I left all hives closed until mid-Feb when they were given home-made sugar candy. All colonies were surviving well in March despite the high losses that were beginning to be reported around the country and so I decided 2013 would be the year of increase! I left all BeeCosies on as temperatures increased in Spring to encourage brood rearing and by the end of May all colonies were developing strongly. On 2 June I split one of the double brood hives which was well established. The same day, I also made up 2 frame splits from the brood and a half and the other double by taking 5 frames from each and placing these in two nucs and closing these up for 3 days. The weather was good at the end of June and all these new colonies were queen right by early July so further feeding was done to encourage the colonies to develop quickly as the delayed June gap was upon us. I continued to leave BeeCosies on all the complete hives as temperatures increased and believed that I might through careful management now be up to 7 colonies! Towards the end of June I then had a total of four swarms. All these were captured and for a brief time, I was up to 11 colonies but one of the swarms slowly left their new hive after consuming the stores I fed them. The two nuc colonies were large enough to move to single brood boxes in July so now I have 10 colonies all with BeeCosies feeding off the heather! The BBKA's winter survival survey a few weeks ago showed losses across the UK of 34% with figures for the North East (where almost all BeeCosy sales have been made) of 38%. We have surveyed all Bee Cosy users on the same basis as the BBKA survey - i.e. colonies in place at 31 March. Although our sample is not large as the BeeCosy was only released last autumn we have achieved a 77% survival rate from all those responding. Interestingly, on comparing over-wintering practices among BeeCosy users it appears that keeping varroa trays in may be beneficial to helping your colony survive harsh winter conditions. Many thanks to all those responding to the survey. July 12, 2013 by Chris Wray. At last year's honey show i collected my new "Bee Cosy". The day after I placed it on my hive, then let nature do its thing. During the winter which has been very wet I looked in my apiary and the two hives without a "Cosy" were wet, (to state the obvious) but the hive with the "Cosy" on looked dry, the water seemed to run off like water off the proverbial duck's back. Then the snow came, and when I went to check my apiary the hives were covered in snow but the hive with the "Bee Cosy" on had around four inches of snow on top and the the two hives without a "Cosy" on only had around an inch of snow covering them, and something else I noticed, on one part of the roof the snow had melted more and I wondered if that was where the cluster of bees were and the heat they were generating had melted the snow more in that spot, no such melting spot on the hive with the "Cosy" on and so much more snow on top, the only other question I had to ask myself, was there any heat being generated at all by the bees to melt the snow, or had the harsh winter killed my bees? The snow was still lying around there was no way of knowing, I just had to wait for a warmer day. A week or so later I saw bees flying around all three hives. On the 12th February I had a quick peek under the roofs of all three hives to check the fondant levels. The two hives without the "Cosy" on had definitely been using the fondant, and the hive with the Cosy on had not touched it. Also I noticed that they seemed more active, not as sluggish as the other two hives. the day after, more snow fell. This time I took some pictures, you can see the difference in the depth of snow and the spot where the snow has melted more. Hope this has been some help to you. April 20, 2013 by Chris Wray. Having a great day out at the the Yorkshire BKA Conference at York 6th Form College. Bad news is that some of the beekeepers we've spoken to have losses of 50% +. Great conference this year - sold out - so book early for next year! It was great to take a stand at the BBKA Spring Convention at Harper Adams last Saturday. We met and spoke with beekeepers all day talking about the challenges of wintering bees, made lots of new contacts and even spoke to the queen's beekeeper!. It seems "distance starvation" is the key killer this year with colonies just not able to move across frames and get to stores. It will be interesting to see what the the winter survival statistics show this year. We are hoping that those with Bee Cosies will have fared better! April 15, 2013 by Chris Wray. 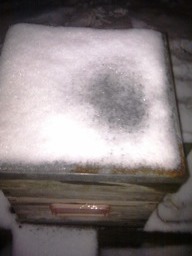 Bee Cosies were placed on 3 of our 4 hives in early November. Little did we know that we would suffer the worst winter in North Yorkshire for 30 years with snow drifts over 10 ft. It was great to open up the hives yesterday and find all 4 had survived such a harsh winter! I had fed them all fondant in late February when I could open up the hives in a brief warm spell. April 13, 2013 by Chris Wray. A great summary of what happens to us all if the bees die! November 13, 2012 by Chris Wray.